We offer Super Puppy, Basic, Intermediate, and Advanced training. We offer several training packages. By the month at our location, private lessons, and group classes. We offer advanced training but we do not train off leash obedience. The amount of training needed to proof a dog 100% for off leash obedience would price a dog in the $50,000 range. Military dogs do have this level of training and are priced accordingly. Even dogs with advanced training will think for themselves on occasion--they are not robots. Most great trainers have a story about working their dog off leash at a park when a squirrel runs by and the dog takes off after it, right into the road, and gets hit by a car. Taking your dog out off leash is not worth the risk of losing a beloved family companion. We will work with you to create a dog who feels off leash while still under your constant control. Education is at a basic level. 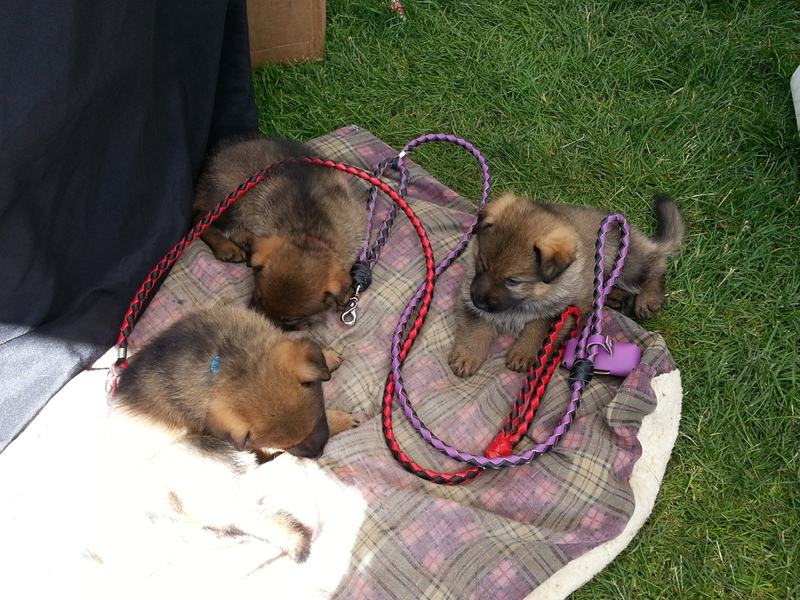 The pups have learned how to learn so you future education efforts will produce rapid results. All education is without force. Puppies are taught how to work in partnership and how to use their own mind during the training process. 1- Beginning loose leash left or right side heeling. Due to popular demand we are now offering an new training package. This package can stand alone or be added to the other levels. The Complete Socialization package takes your dog to a new level. The dog will be taken out of state to learn how to behave on an airplane (service dog prospects only) or during a road trip. The dog will be trained in a large city like Los Angles, or San Diego. The dog will be taken to the beach and other novel experiences that are not available in Arizona. A trip to Disney Land can also be added for service dog prospects. Your dog will be rock solid in public and during travel after going through this program. Super Puppy is a bonding and language development class. During this class your puppy will learn that all good things come from you not the environment. You will teach your puppy how to learn and you will also learn how to listen to your puppy when he/she tries to communicate with you. Start right is a program for those who have bought a trained dog. The dogs handler will transfer leadership of the dog to you during this course. You will learn how to perform all of your dogs cues effectively, and you will learn how to introduce your dog to his/her new home. This course takes place in your home and out in public depending on your new dog’s level of training.